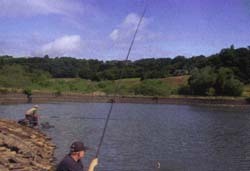 Slaithwaite DAC control the fishing on this deep reservoir. The venue is also available on a day ticket and is classed as a mixed coarse fishery with bream and roach targeted in the warmer weather and good pike sport in the colder months. The bream go to 6lb and the roach to 1lb 8oz. On the predator scene perch can top 3lb and the pike 20lb. Tickets are £4 per day in advance only. Slaithwaite DAC has an open membership, fees: adults £29, u18s £10, OAPs and registered disabled £9.50, u16s £5. From J23, M62 take the A640 towards Huddersfield. Turn right onto Longwood Edge Road, go down here and turn right again into Gilead Road. Turn right again into Dod Lee Lane and at the crossroads take the right turn onto Holmefield Road. Parking and access are on the right.